Accuracy: 0. 10% on dia & 0.15% on surface. Work Stage Table: 200x200mm. X & Y axis, Traverse 25mm in each direction having least count .01mm. - Noise-free cooling system for long time projections. - Complete with attachments for projection of 3¼ x 3¼" and 2 x 2" projection slides, 35mm film strips and prepared micro-slides. - Provided with 100W-220V ac halogen bulb, cord & plug. - Fit for sharp projection upto 30 ft.
We want to sell our Profile Projector having diameter of 300 mm screen with 90° cross line and chart holders. We hold expertise in meeting the demands of Optical Profile Projectors. It is widely used in measuring room and workshops for the industries of machinery- making, instruments, watches etc. 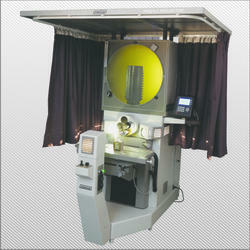 The profile projector is used in ensuring high accuracy in dimensional measurements and surface inspections. We are an eminent name in providing Optical Profile Projectors to our clients. 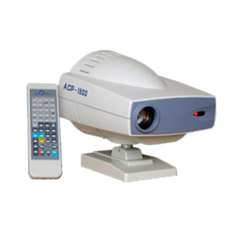 These projectors are known for their long service life, robust construction and less maintenance. Our Optical Profile Projectors are designed by using latest technological specifications as per the set industrial norms and standards.